One of the best things about Princeton Landing is our mature landscape. Unfortunately, during the winter months our trees and shrubs succumb to severe browsing damage by the subject of our next feature, the beautiful but destructive White-tailed Deer. 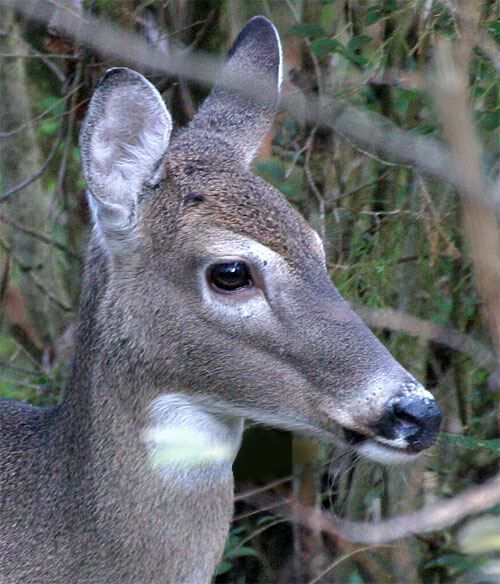 "One species that seems to be on the increase in our area is the White-tailed Deer. They are particularly successful because, except for cars and trucks, most of their natural predators have been eliminated. "The coat of a White-tailed Deer is reddish-brown in spring and summer and gray-brown in fall and winter. The white underside of its tail signals alarm when the tail is raised during escape. Adults are about 40 inches tall at the shoulder and about 5 or 6 feet long. The male buck usually weighs from 130 to 300 pounds; the female doe weighs from 90 to 165 pounds. "Males grow new antlers every year, starting in late spring. In fall they compete for the opportunity to breed with females, and successful males are often seen escorting several females in a small herd. Females give birth to one, two or even three spotted fawns in May or June. Fawns lose their spots during their first summer. 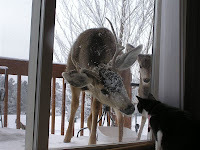 "The diet of White-tailed Deer varies through the seasons according to the availability of food sources. They forage on a wide variety of plants, eating shoots, leaves, acorns, fruit and grasses. They even eat some things that we would consider dangerous, such as poisonous mushrooms and red sumac." The ornamental trees and shrubs in Princeton Landing are an irresistible food source to the White-tailed Deer. A careful selection of plants can help eliminate some of the damage. We can reduce our maintenance costs and improve the appearance of our landscape by being more thoughtful about what plants we install in the future.